Our kids love my chicken soup. In order to make it both pup and human friendly, I omit certain ingredients like onions and other not-so-pup-friendly spices. What's left is low sodium chicken broth, diced chicken breasts, carrots, green beans, egg noodles, a tiny bit of corn, basil, and oregano. I let it simmer for about an hour. Once cooled, I add some pieces of my homemade whole wheat bread. The kids lick their bowls clean. There is always fresh, seasonal produce in our home. During the Summer months, there's an abundance. Our neighbor friends share the bounty from their gardens and we also frequent a few local Farmers Markets. Each week, throughout the year, we peel and dice up fresh produce for our kids to enjoy with their meals or for a snack. Our kids love their fresh produce salads. For over 5 years, we've been making homemade meals for our kids. Yes, it involves extra time in the kitchen to prep and cook, but it's SOOO worth it. The meals we make for our kids always include lean cuts of meats (chicken breasts, beef, turkey, and fish) cooked in a variety of ways, fresh and cooked vegetables, fresh produce, and whole grains. We also add mashed sweet potatoes and a few times a week, we add a dollop of Greek yogurt. When we're expecting bad weather that could result in a power outage, we prep enough for several days. The bulk of the homemade meals we make our kids is lean protein. Chicken. Beef. Fish. Turkey. We cook their protein in a variety of ways. 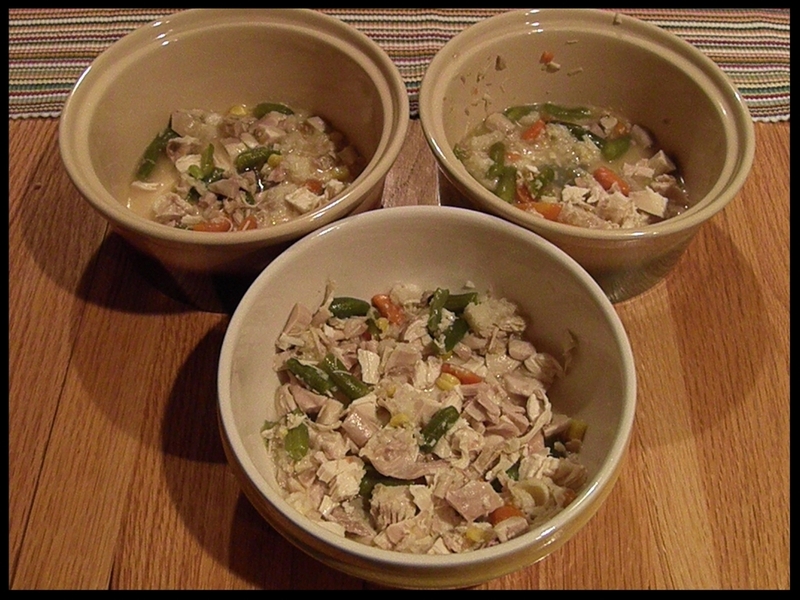 One of their favorites is when I make their crockpot meals. I add several pounds of lean protein. Then, I top it off with fresh produce and sweet potatoes. 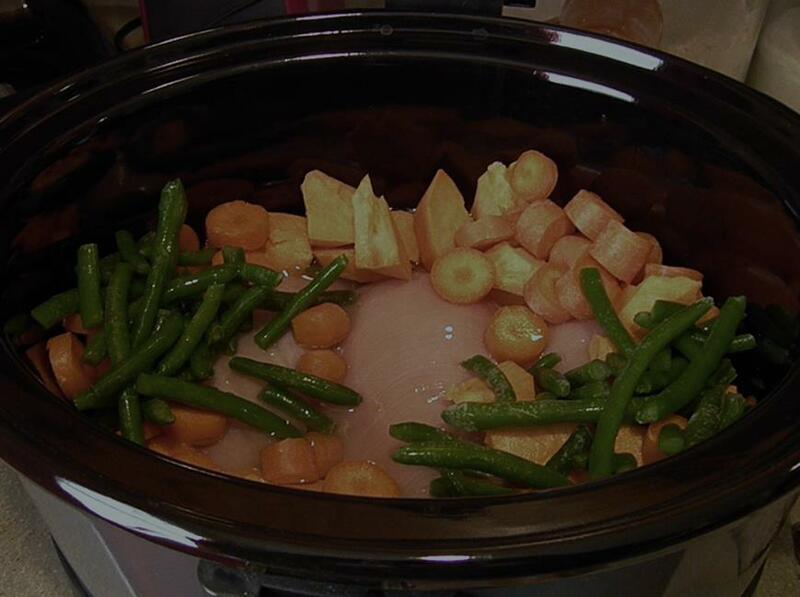 This crockpot meal included boneless chicken breasts, carrots, green beans, and sweet potatoes. I cook on high for about 5-6 hours. When it's done, I take the produce out. Then, I shred the chicken with the juice still in the crockpot. The chicken soaks it up. The kids love it! Here is another crockpot meal that our kids gobble up. It's pup friendly beef stew. I add a few pounds of stew beef, potatoes, carrots, and green beans. I add a pinch of basil and oregano. I let simmer for 5 to 6 hours. Towards the end, I add a tablespoon of flour to thicken it up a bit. That's it! This photo was taken before Willa joined our family last year. We cooked out on the grill as we do a lot during the warm weather months. 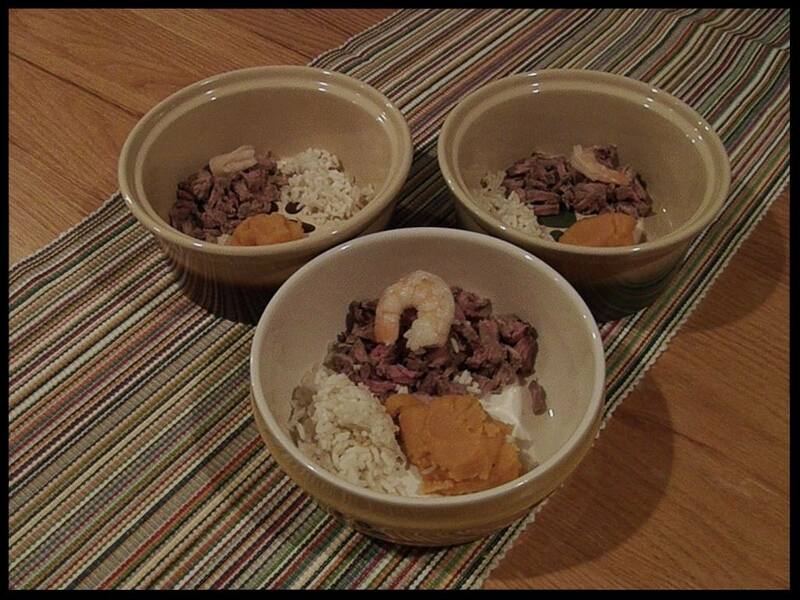 Steak and shrimp. 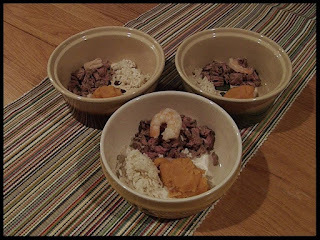 We always put aside a piece of steak and a few shrimp to grill without the marinade we use on ours. Once the meat is cooled we dice it up, add their sides, and watch the kids gobble up their dinner. Then, they beg for some of ours. Another crockpot meal! A lot of people have reached out and asked, "How much of this? How much of that?" With crockpot meals, I don't measure. I toss in their lean protein and pup friendly vegetables. 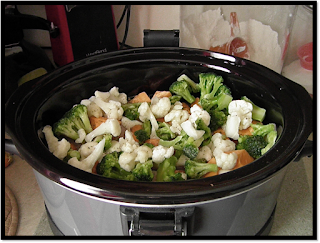 However, if you're looking for measurements and some tips for making crockpot meals for your kids, I published a blog column that will be helpful. You can find that here.